All Dog Breeds , American Cocker Spaniel , Australian Shepherd , Bedlington Terrier , Border collie , Cardigan Welsh Corgi , Dachshund , Dalmatian , Doberman Pinscher , English Cocker Spaniel , Flatcoated Retriever , Fox Terrier , French Bull Dog , Galgo Espanol , German Longhaired Pointer , German Shorthair Pointer , Gordon Setter , Griffon Bruxellois , Irish Soft Coated Wheaten Terrier , Koolie ( Australian Koolie ) , Labrador Retriever , Miniature Pinscher , Newfoundland , Pointer , Portuguese Waterdog , Scottish Terrier , Weimaraner . The B locus is responsible for the presence of brown, chocolate, or liver coat colour. It is also responsible for nose colour. In breeds where the A locus does not come into play, any dog that has at least one B allele (and is not 'ee'), will be black in the pigmented areas of the coat. If the dog has two copies of any of several b alleles will be brown. There are at least three such b alleles. 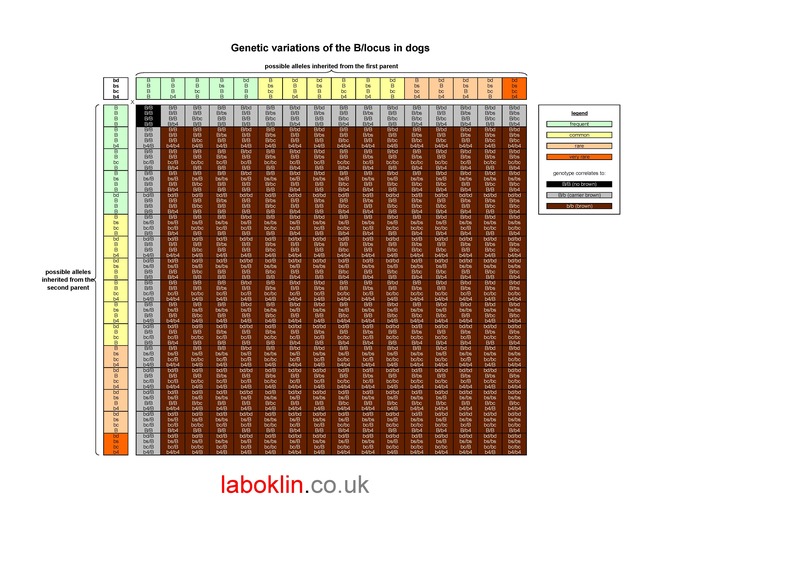 Regardless of other loci, any dog with at least one B allele will have a black nose and pads, while those with any two b alleles will have a liver nose and pads. 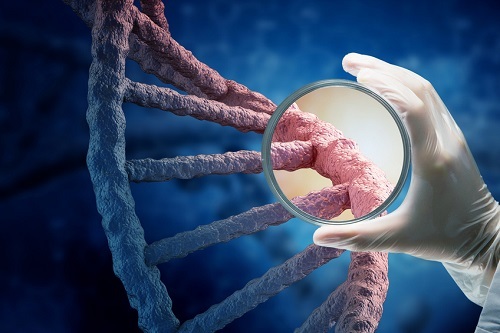 This test checks if the dog carries 0, 1 or 2 copies of the mutations typically responsible for the brown coat colour, which is also known in some breeds as liver, chocolate, sedge, and less frequently, red. There are three primary 'b' mutations that are responsible for nearly every liver or chocolate dog. A notable exception is the French Bulldog where in addition to these three mutations, there is a fourth cause of chocolate that has yet to be identified. In some breeds such as Gordon Setter this coat colour is referred to as liver. Afghan , All Dog Breeds , Australian cattle dog , Australian Shepherd , Beagle , Border collie , Brittany Spaniel , Cardigan Welsh Corgi , Chow Chow , Cocker Spaniel , Dachshund , Dalmatian , Doberman Pinscher , English Cocker Spaniel , English Setter , English Springer Spaniel , Field Spaniel , Flatcoated Retriever , Foxhound , French Bull Dog , German Longhaired Pointer , German Shepherd , German Wirehaired Pointer , Gordon Setter , Koolie ( Australian Koolie ) , Labrador Retriever , Lowchen , Miniature Schnauzer , Pointer , Pomeranian , Poodle , Pudelpointer . Please note that in Australian Cattle Dog, anothermutation E Locus E2 is responsible for this coat colour and both E Locus E1 and E2 must be tested in this breed. Please note that this test will only check for the KB and ky alleles, it does not check for the kbr (brindle). Laboklin no longer offers a test for Brindle. The K locus plays a pivotal role in coat colour. This locus is a relative newcomer in our understanding of canine colour, and includes traits formerly attributed by some to other genes. The dominant allele in the series is KB, which is responsible for self-colouring, or solid coloured fur in pigmented areas. This trait was formerly attributed to the Agouti (A) locus as AS, but recent breeding studies had shown this not to be the case. There are two other alleles, kbr, and ky. KB is dominant to both kbr and ky, while kbr is dominant only to ky. kbr is responsible for the brindle. The recessive allele, ky, allows the basic patterns of the A locus to be expressed. So too does the kbr allele, but with brindling of any tan, fawn, or tawny areas. Any animal with at least one KB allele will be self-coloured. LABOKLIN can presently test for these two alleles. In some breeds, where no brindle is present, this represents a complete analysis of the locus. An example would be the Pug. In breeds where the breed standard disqualifies all but self-colored dogs, testing for these two alleles is once again all that is needed. Any animal with two KB alleles cannot produce anything except self-coloured offspring. A prime example here is the Labrador retriever. In breeds where many variations are allowed, these tests can help predict the probability of potential litters to include fawn, sable, tawny, tan point, tricolor or recessive black puppies.